It’s not easy, but with loving advice and a supportive community, Quakers are encouraged to keep trying. Quakers are concerned about the excesses and unfairness of our consumer society, and the unsustainable use of natural resources. We try to live simply and to give space for the things that really matter: the people around us, the natural world, our experience of God. Perhaps Quakers are best known for our peace testimony. This arises from our conviction that love is at the heart of existence and all human beings are equal in the eyes of God, and that we must live in a way that reflects this. The peace testimony has led Quakers to refuse military service, and to become involved in a wide range of peace activities, from practical work in areas affected by violent conflict to the development of alternatives to violence at all levels from personal to international. Quakers do this in a variety of ways; campaigning and raising awareness around issues of economic and social justice, offering support and guidance to those seeking alternatives to violence, working to challenge and change the circumstances that lead to war, and by seeking to live peacefully within our own homes and communities. 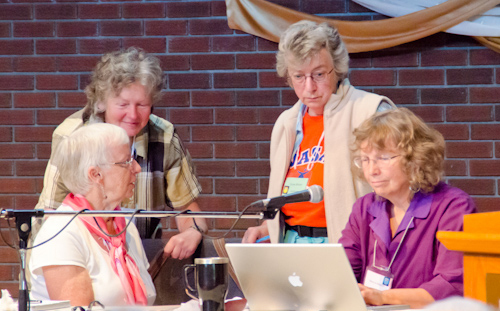 Throughout our history, Quakers have sought to live out these values, both individually and as a community, in the ordinary detail of our lives and in the wider world where much of our work is done through Canadian Friends Service Committee. This way of life is shaped by a deep commitment to these testimonies. It grows from a belief in the sanctity of all life and that there is something sacred in everyone. It is nourished and rooted in our practice of silent and attentive worship.